Description: This robin-sized sandpiper has yellow legs and a slightly decurved, dark bill, often with a yellow or dull green base. In breeding plumage, look for a buffy, black-streaked back, white supercilium, dark loral stripe and a light brown neck and breast with blackish stripes. In all plumages, there is a strong demarcation between the breast and white belly. Similar Species: Pectoral Sandpipers are most likely confused with other yellow-legged sandpipers. 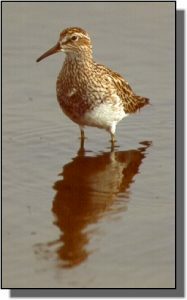 They are larger than Least Sandpipers and the strong demarcation between the upper breast and white belly distinguish them from Stilt, Upland and Buffbreasted sandpipers, Ruffs and yellowlegs. Pectoral Sandpipers tend to use wetter, more densely vegetated areas than other sandpipers. Baird’s Sandpipers are smaller with black legs. Comments: Pectoral Sandpipers winter in southern South America and nest in low to mid-arctic tundra. During courtship, promiscuous males inflate and deflate pendulous breast sacs and create foghorn-like “hooting” while performing undulating aerial displays.